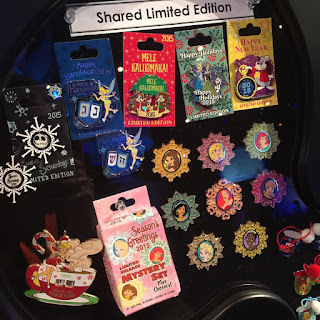 After quite a long time, we have a pin preview of something to come this holiday season. 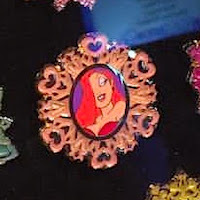 The Seasons Greetings 2015 Mystery Set will feature Disney Princesses like Elsa, Belle and Tiana - but also includes Jessica Rabbit. There is no word on how many characters will be in the set, but the front package does state that there are chaser pins, so there's no telling yet which characters will be included. All the pins are shaped like a different snowflake, each other filled with a different glitter color. Jessica's boarder is pink with silver heart shapes. She is in a silver bordered oval in the center. The pose seems to be similar to her Valentine's Day 2005 pin. There's no word on price or edition size, but it is marked as Limited Edition. Thanks to José for spotting this on the GenEARationD Facebook page.